Microsoft announced their fiscal Q3 (calendar Q1) results last week, and the figures were surprisingly stable given the steep decline in PC shipments this quarter. Microsoft announced Q3 revenue of $20.49 billion and an operating income of $7.61 billion. The Windows division revenue was flat sequentially, at $5.7 billion. However, a deeper look at the numbers show some worrying signs. Microsoft's Windows revenue in Q4 and Q1 includes deferred revenue from Windows upgrade offers (from Q3), so the numbers themselves may be a tad inflated. However, this in itself is just a minor issue. Practically all of the revenue generated from the Windows division comes from sales of Windows licenses for x86 devices. Windows Phone revenue is practically non-existent as Nokia, the largest Windows Phone manufacturer by far, pays Microsoft just about as much as Microsoft pays Nokia in platform support payments. Windows RT tablets have barely had any impact on the market, so any revenue generated from that segment was probably just a tiny flash in the pan (in Q4). 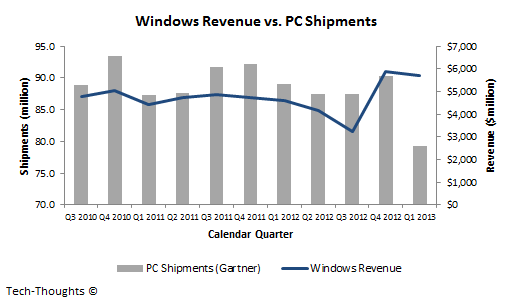 In the Windows division, revenue was flat this quarter. Within that, OEM revenue performance was in line with the underlying x86 PC market, which continues to be challenged as the PC market evolves beyond the traditional PC to touch and mobile devices. This quarter, inventory levels were drawn down as the channel awaits new Windows 8 devices. Non-OEM revenue grew 40% this quarter, driven by sales of Surface and continued double digit growth in volume licensing. Businesses continue to value the Windows platform, and volume licensing of Windows is on track to deliver almost $4 billion in revenue this year, and nearly three-quarters of enterprise agreements that we signed this year include Windows. Microsoft claims that the decline in Windows revenue from OEMs was made up by sales of the Surface and volume licensing. Given the low shipment estimates for the Surface RT & Surface Pro, the proportion of Windows revenue from Surface was probably low. Also, given low consumer interest, Surface shipments should continue to decline until a new product is launched. This leaves Windows volume licensing, which was driven by enterprises continuing the upgrade path from Windows XP to Windows 7 (driven by the closing support "windows" for Windows XP and probably discount offers to enterprises). Therefore, this revenue spike is likely to be a one-time event as upgrade cycles tend to be concentrated around OS launch timelines. In any case, a 40% revenue spike in non-OEM revenue could hardly be considered sustainable. Microsoft also stated that Windows revenue from OEMs was in line with the drop in PC shipments. PC shipments should continue to decline throughout the year (a minimum 8-10% annual decline as per my most recent forecast), which should pressure Windows revenue over the next few quarters. With negligible revenue from Windows Phone (thanks to Nokia's platform support payments), little consumer & OEM interest in Windows RT and slowing volume licensing revenues as enterprise customers complete their migration cycles to Windows 7, the future of Microsoft and Windows looks murkier than ever. I believe Microsoft is counting revenue from Surface hardware as part of the Windows division, which would account for the YoY shortfall in OEM revenue. Between Surface Pro and SurfaceRT, Microsoft probably sold 700-800k units at an ASP of $750. That represents 10% of the Windows revenue base (at very little margin, of course). True, but the that's only about $600m. The scale of drop in OEM revenue (in line with the PC market) hints that volume licensing revenues were responsible for a large chunk. That isn't sustainable. IMO, $600M from Surface represents the majority of the shortfall from OEM revenue YoY. At $50 per licence, $600M represents revenue from 12 million OEM PCs, which pretty much accounts for the YoY decline IDC projected. Either way, I agree with your general premise that trading OEM revenue for either Surface or volume licensing revenue is smoke-and-mirrors. If anything, Surface revenue is worth less, since it carries negligible margins compared with software sales. That actually doesn't add up. If you take a look at the YoY comparison, Windows division revenue is bot flat, but up by more than $1 billion. The deferred revenue from Windows upgrades (~$500 m over 2-3 quarters) is added. So even if you exclude that and the $600m revenue from the Surface, the rest of the revenue segments still saw growth. This means that the volume licensing spike more than made up for the loss in OEM revenue.